It's hard to imagine that one tweet from Australian Greens deputy leader Adam Bandt could change the terms of the climate change policy debate in Australia. But it has. On 17 October, as fierce, out-of-season bush fires erupted around Sydney and destroyed 200 houses after the hottest year on record in Australia, Bandt tweeted that Australia would experience more terrible climate impacts if newly-elected conservative prime minister Tony Abbott got his way and abandoned the carbon pricing and renewable energy legislation enacted by the Labor government in 2010. The previous day, Bandt had written in The Guardian that: "Faced with the biggest ever threat to Australia's way of life (bush fires), Tony Abbott is failing in the first duty of a prime minister which is to protect the Australian people." 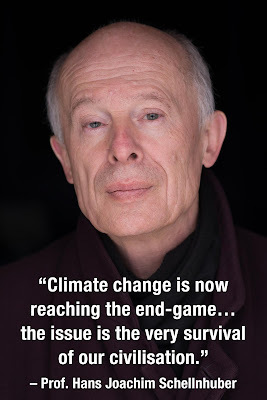 This struck a chord with many people and launched a long overdue, but until now suppressed, public discussion about the relationship between a hotter and more extreme climate and worsening disasters. A taboo had been broken, and amidst intense debate the dam wall broke. 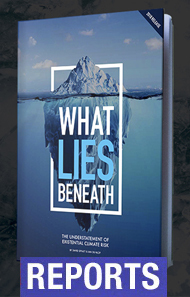 Support for this necessary conversation came from everywhere: climate action advocacy groups, Labor backbenchers Kelvin Thompson and Doug Cameron, senior political commentators, scientists and editorial writers. Lenore Taylor observed that "policymakers can no longer credibly look away." UN climate chief Christiana Figueres told CNN that the Abbott government would pay a heavy political and economic price for going backwards on climate action. 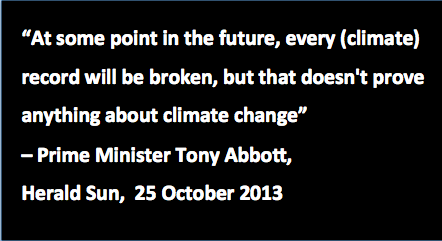 For three years, Abbott has dominated the public climate debate with a relentless negative campaign on Labor's carbon tax, a fig leaf for his long-term climate denialism that "the science isn't settled", is "highly contentious" and "not yet proven", that "it's cooling" and "it hasn't warmed since 1998" and there's "no correlation between carbon dioxide and temperature". Now accused of "failing to protect his people", Abbott refused to respond for days, and instead headed off for duty with his local volunteer fire brigade. But shouldn't the Prime Minister be leading the country, not his local fire brigade, at a time of emergency? 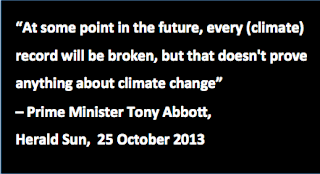 For the first time in years, the prime minister was no longer on the front foot in the climate policy discussion. That climate change would load the dice in favour of more intense disasters is well established. Fire researchers in 2007 estimated that climate change would result in a two-to-fourfold increase in extreme fire days. Between 1973-2010, Melbourne and Adelaide recorded a 49% increases in their cumulative annual Forest Fire Danger Index. And in February 2009 Victoria's Black Saturday bushfires killed 173 people, injured 414, destroyed 2,029 homes, and cost $4.4 billion in damage. The fire index was an unprecedented 190 on a zero-to-100 scale. Yet the possible impact of climate change on the days' events and planning for the future was excluded from the subsequent royal commission's terms of reference. Now the taboo has been broken, what does in mean for the debate in Australia as prime minister Abbott prepares to trash Labor's legislation? Labor and the climate advocacy movement made a strategic mistake in 2010 by trying to sell the climate legislation as about "clean energy futures" and "saying yes" without talking about how climate change would affect people's lives. It was all about selling good news and not mentioning bad news, selling an answer without elaborating the question. Public support went down. Climate change is a choice between increasing harm, or acting to restore safety. All the studies on health and safety promotion — smoking, obesity, drink driving, HIV, workplace safety — show same thing. Be honest about the problem and tell it like it is; show a better alternative, the benefits of changing behaviour; and finally demonstrate an efficacious path, the "you can do it" actions that the person or society is empowered to take to move from fear to success. The debate which has erupted over extreme climate events has important lessons for all those urging more, not less, action on climate change. 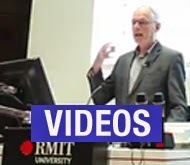 The story should be about people in Australia and not distant places, about now and not just the distant future, about connecting the dots between extreme events and global warming. It is a story about record heat and bush fires, about how family and friends will live in a hotter and more extreme world, about how a retreating coastline will affect where we live and work, a story about health and well-being, about increasing food and water insecurity, and the more difficult life that children and grandchildren will face. This makes climate action a values issue, the choice between increasing climate harm and climate safety. Australian per capita income is the highest in the world, yet we are less happy than citizens in austerity-riven Spain. Society's pace of change is creating new fears and insecurities as people struggle to keep up. They fear for the future in which their children will live. Hyper-consumption is being driven by anxiety — fear of being left behind, of being "unfashionable" in the broad meaning of the term — and an increasing sense of self-entitlement. Sociologist Zygmunt Bauman says that "human vulnerability and uncertainty is the foundation of all political power". Abbott understood the politics of fear in his tearing down of the Labor government. Can he now be stopped by constructing a narrative that recognises reasonable fear and provides a clear path to climate safety, rather than increasing personal and planetary insecurity? 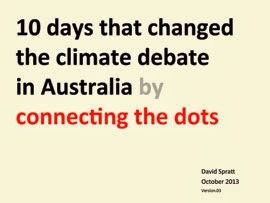 Can John Howard's and Tony Abbott's "battlers" become safe-climate champions?